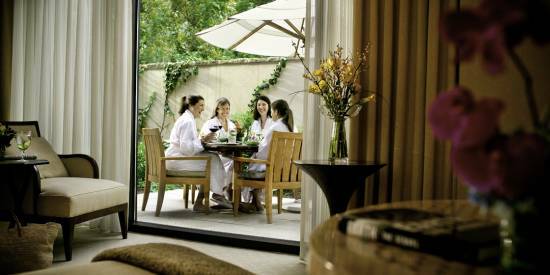 30 Hand-Picked Experiences for Your Spring Bucket List in Raleigh, N.C. Roll call! Who&apos;s ready for beer festivals, outdoor concerts and food truck rodeos? We&apos;ve got big plans this spring in Raleigh, N.C.! To jump-start these warm-weather months we&apos;ve put together this list of 30 items for your spring bucket list, perfect for planning a trip to the Raleigh area with friends and family. Need more inspiration? Follow us on Instagram or give us a shout on Twitter—we&apos;re here to help! 1. Bike Raleigh&apos;s Art to Heart Trail, beginning at the North Carolina Museum of Art (where parking and admission to the museum are free) and ending in downtown Raleigh. This 5.9-mile trail winds through the museum’s beautiful 164-acre park, passes behind Meredith College, cuts through the main campus of North Carolina State University, zips by Pullen Park and finishes in the heart of the city just outside of the Duke Energy Center for the Performing Arts (where treats from Bittersweet, lucettegrace and Boulted Bread aren&apos;t far away). 2. 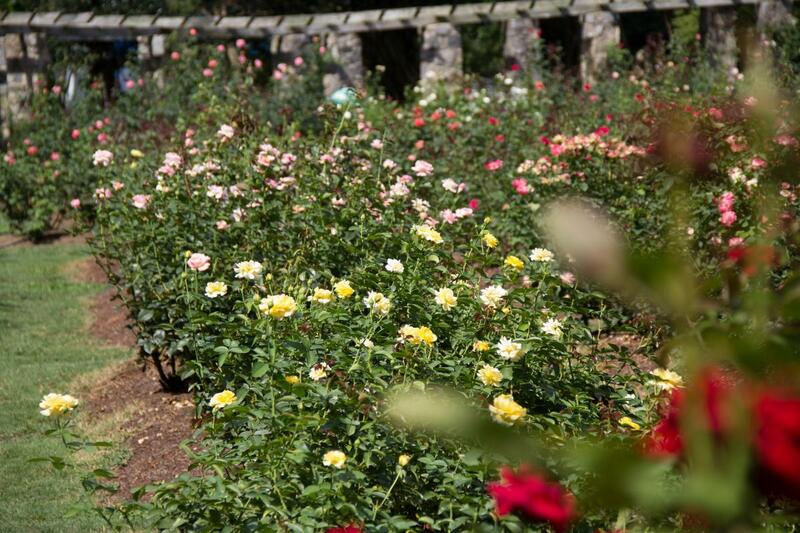 Stroll through JC Raulston Arboretum at North Carolina State University--a free, nationally-acclaimed garden with tons of fun spots to explore--or get lost in the Raleigh Municipal Rose Garden, where more than 1,200 roses of 60 different varieties decorate the grounds (blooming typically begins in late May). 3. 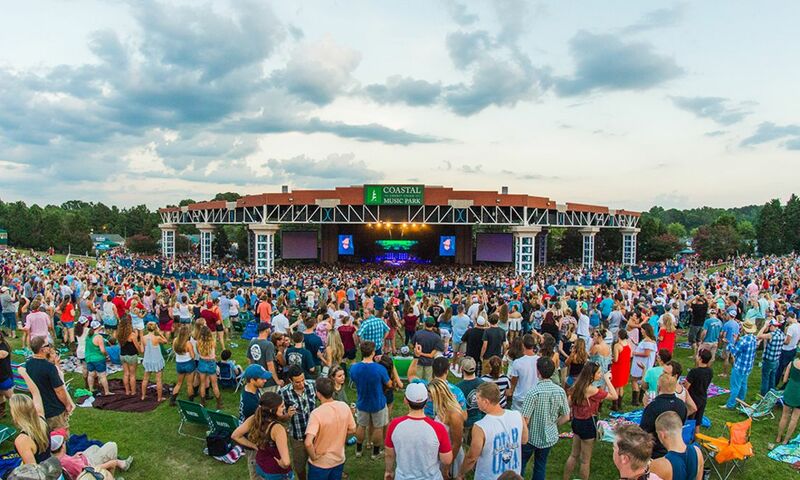 Gear up for another huge season of outdoor concerts—scoop up your tickets for Fleet Foxes (5/3), Steely Dan and the Doobie Brothers (5/11), Vance Joy (5/12), Post Malone and 21 Savage (5/21), Outlaw Music Festival: Willie Nelson, Sturgill Simpson, Alison Krauss and others (5/25), Kendrick Lamar (5/26), First Aid Kit (6/8), Arctic Monkeys (6/16) and plenty more! 4. Pay a visit to downtown Cary&apos;s Ashworth Drugs, the iconic pharmacy/soda shop/hot dog joint that has been a constant at the corner of W. Chatham and S. Academy Sts. for more than 60 years now, then head to downtown Wake Forest to dine at the area&apos;s oldest restaurant—Shorty&apos;s Famous Hot Dogs, serving bright-red dogs with homemade chili on steamed buns for more than 100 years (and still owned by the same family that started it all). 5. Break out the peanuts and Cracker Jack—the Carolina Mudcats (Class-A Advanced affiliate of Major League Baseball&apos;s Milwaukee Brewers) return to the diamond in Zebulon in early April for a full season of action. You&apos;ll find $1 tacos on Tuesdays, $1 hot dogs on Wednesdays, half-priced draft beers on Thursdays and Friday night fireworks all season long! 6. Book a stay at The StateView Hotel, a brand-new Autograph Collection property by Marriott located on North Carolina State University&apos;s Centennial Campus. Stunning views of Lake Raleigh, an innovative on-site restaurant (Flask & Beaker), a beautiful pool area and easy access to nearby James B. Hunt Jr. Library (named one of the world&apos;s most beautiful libraries) and Lonnie Poole Golf Course (a challenging, NCAA championship-level layout) make for can&apos;t-miss accommodations. 7. Find inspiration at CAM Raleigh, the state&apos;s only non-collecting contemporary art museum, where artist Anne Lindberg&apos;s solo exhibition the long sun (through 6/10) uses both two- and three-dimensional mediums to beautifully ponder time, causality and sequence. Below, meet Gab Smith—CAM&apos;s executive director and the woman at the epicenter of Raleigh, N.C.&apos;s art scene. 8. Pack a picnic and spend a sunny afternoon lounging at Dorothea Dix Park, with tons of green space and skyline views of downtown Raleigh, or plan a night out with friends or family to see a movie under the stars when Dix Park and Alamo Drafthouse Raleigh team up to show Spaceballs (5/5). 9. Brunch! Who doesn&apos;t love get-togethers for muffins and mimosas? 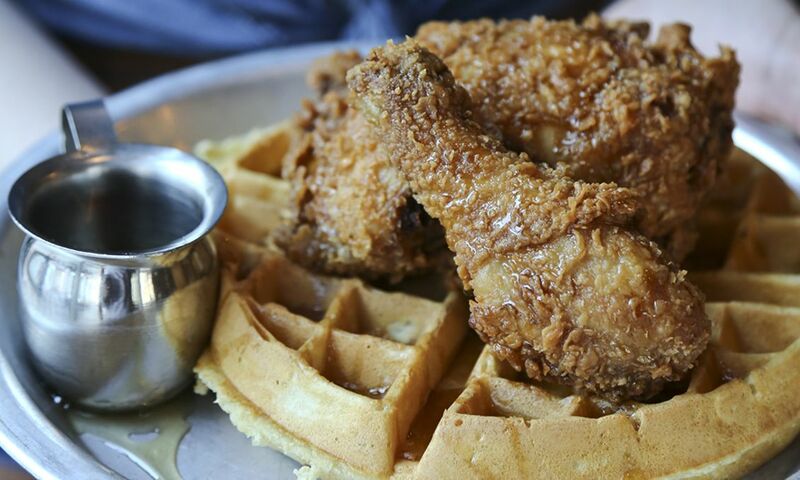 Travel and Leisure named Raleigh, N.C., one of America&apos;s Favorite Cities for Brunch, so spend a weekend morning taking a bite out of some of the Raleigh area&apos;s favorite spots for drool-worthy eggs Benedict, mouth-watering chicken and waffles and Instagram-ready breakfast cocktails. 10. 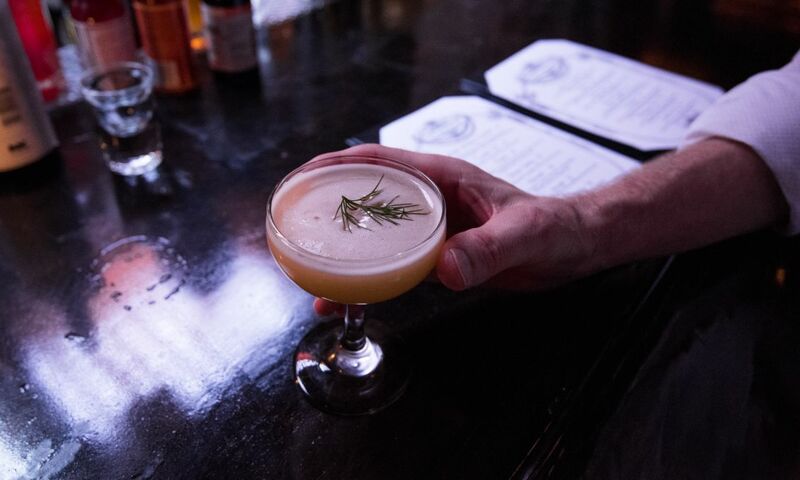 Speaking of cocktails, from sophisticated speakeasies to welcoming neighborhood hangouts, the craft drink culture in the City of Oaks is as vibrant as ever. Hummingbird, a brand-new coffee shop/cafe/cocktail spot from chef Coleen Speaks, won us over with the bar&apos;s signature cocktail—the Hummingbird, a vibrant hibiscus tea-infused drink. And while you&apos;re there, it&apos;d be wise to pair your libations with some of the small plate offerings like the charbroiled oysters or tōgarashi-seasoned popcorn. 14 Cocktail Bars Not to Miss in Raleigh, N.C.
11. Celebrate spring by strolling through any of these 12 parks and gardens (including a stunning 1.5 acres of colorful azaleas at the WRAL Azalea Gardens). 12. Escape the bustle of the city and explore the Raleigh area&apos;s 180 miles of greenways, starting with a 27.5-mile paved path that many consider to be the gem of the Capital Area Greenway System. The Neuse River Greenway Trail—an uninterrupted greenway that stretches from Falls Lake State Recreational Area in North Raleigh (where you can rent a bike from The Bike Guy) to the Wake County line in southeast Raleigh—connects to beautiful parks, crosses suspension bridges and travels through wetlands and agricultural fields as it runs down the eastern edge of the city. 13. 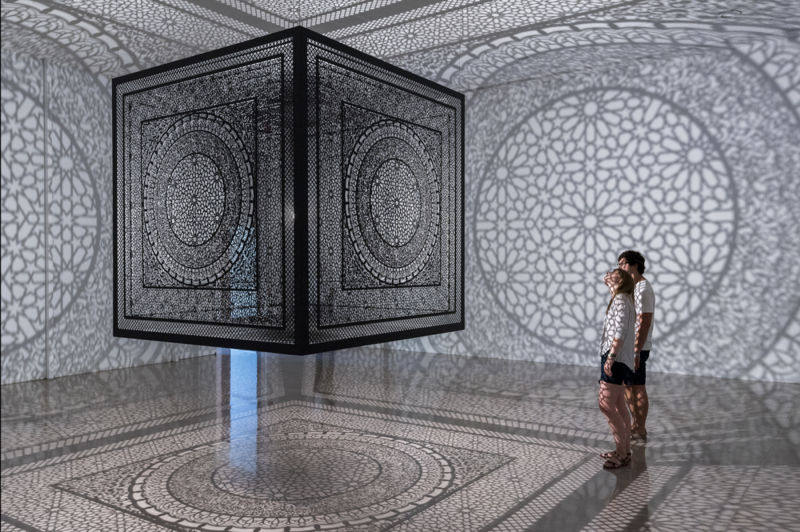 Visit a highly-anticipated exhibit at the North Carolina Museum of Art, You Are Here: Light, Color, and Sound Experiences (open through 7/22), which features immersive art installations by 14 contemporary artists, including large-scale light works, sound installations, video works, mixed-media room-size environments and site-specific projects. This exhibition takes over an entire floor of the museum’s temporary exhibition galleries and also transforms the landscape in the Ann and Jim Goodnight Museum Park, creating a campus-wide presentation of contemporary experiential art. Get a preview of the ticketed exhibit here! 14. Snap your selfie at Sola Coffee Cafe&apos;s gorgeous "I Believe in Raleigh" mural (before or after scarfing down a handful of their famous hot mini donuts), plus hunt down more of the most-Instagrammed spots around town. 15. Planning to be out and about for a fun night in downtown Raleigh? 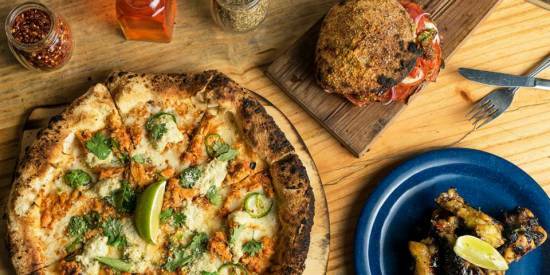 We know you&apos;re going to end up hungry, and we&apos;ve got you covered with these 18 spots to grab late-night grub near the city&apos;s center. 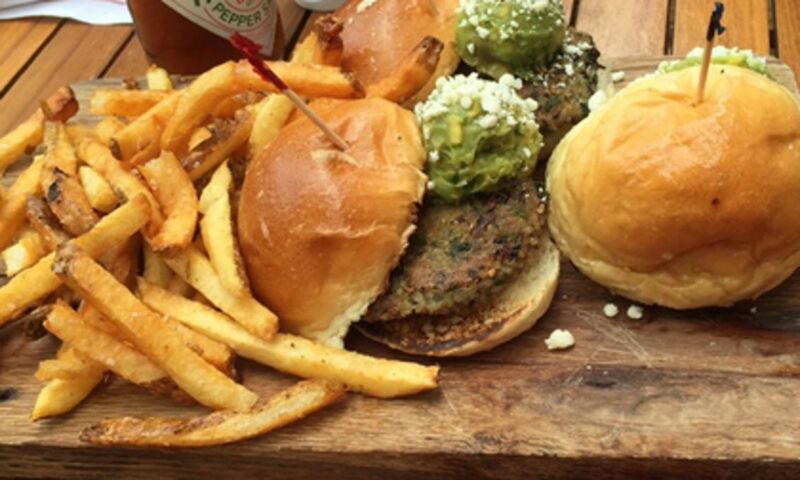 Beer-battered pretzels, burgers and shakes, tacos that hit the spot and a lot more can be found inside and outside of nightlife spots all over town. 16. 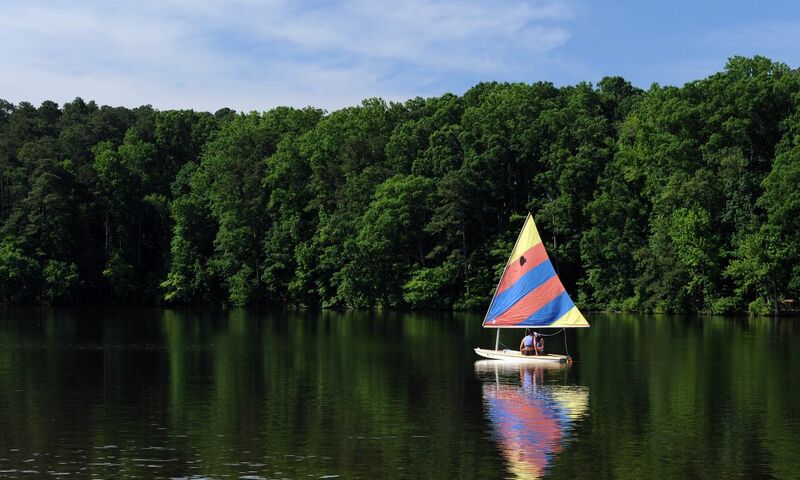 Rent a canoe, kayak, sailboat or stand-up paddleboard and get out on the water! One of our favorite ways to combine relaxing views with a bit of exercise, you&apos;ll find all sorts of adventures to suit your needs. For families, head to Fred G. Bond Metro Park for a day of picnicking and rowing. For a bit more action, unload your canoe or kayak at any of the launch points along the Neuse River Canoe Trail and head downstream. For more, check out our guide to kayaking, stand-up paddleboarding, canoeing and more in Raleigh, N.C.
17. Mark your calendars for Memorial Day weekend—Freedom Balloon Fest (5/25-28) is set to return! This family-friendly, truly-unique event runs for four days at Fuquay-Varina&apos;s Fleming Loop Park. The admission-free festival invites the public to enjoy dozens of hot air balloons as they fill the skies in honor and remembrance of those who have served in the military. Tons of live music, an arts and crafts village and food vendors on hand make this a fun event for all. Don&apos;t forget your cameras! 18. Explore more than 30,000 square feet of fresh vegetables, produce, flowers and specialty goods at the State Farmers Market Raleigh (open seven days a week—strawberry season is mid-April to mid-June! ), plus swing by the Raleigh Downtown Farmers Market to shop for seasonal goods and prepared foods from local restaurants (Wednesdays, 10am-2pm, mid-April through mid-Oct.). 19. 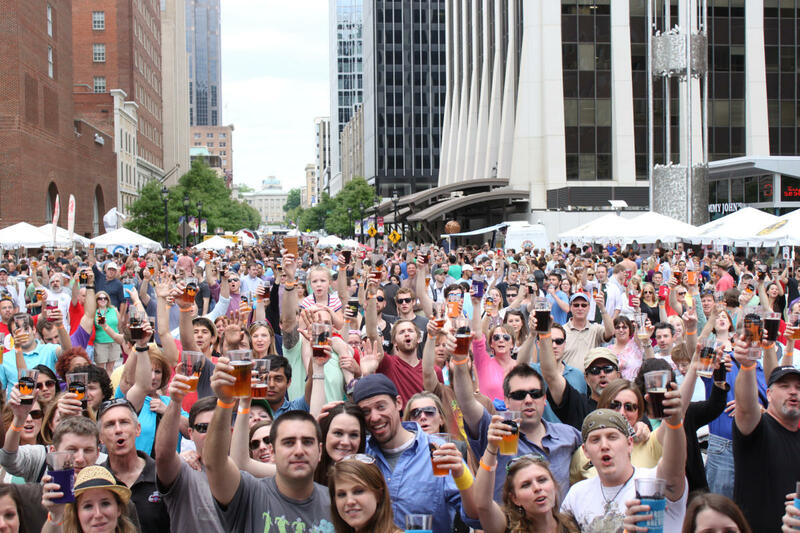 Grab your drinking buddies and head to Brewgaloo (4/27-28)—N.C.&apos;s largest craft beer festival, featuring 100 breweries, 50 food trucks and drawing 30,000 people—which takes over downtown Raleigh for two days each April. The festival, with free admission on Sat. (so bring plenty of friends! ), allows you to purchase either beer samples or full pints from breweries located across the state. The event is part of Beer Month in Raleigh, N.C., a month-long celebration of the nearly 30 craft breweries that call the area home. 20. Take a day to splash to your heart&apos;s content at Buffaloe Road Aquatic Center, one of the area&apos;s most kid-friendly indoor swimming venues with a three-story water slide, lazy river, water vortex and more waiting to be conquered. 21. 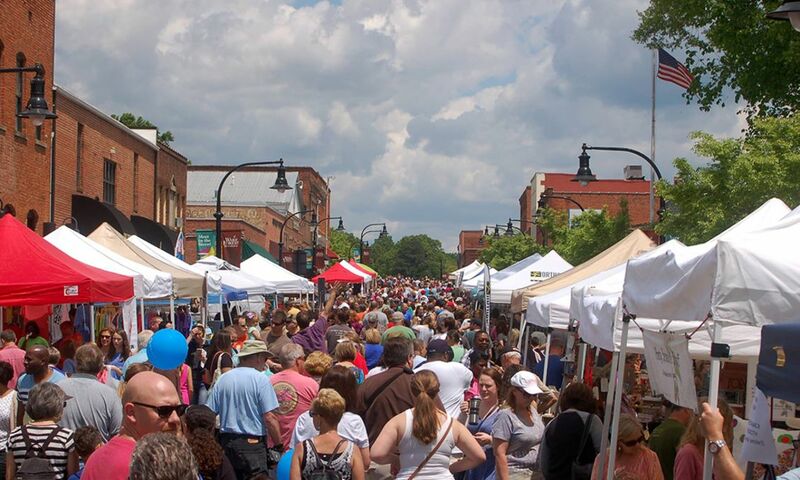 Check out these 14 awesome festivals in towns surrounding Raleigh, including Spring Daze Arts and Crafts Festival (4/28), Beer & Bacon Fest (5/19) and the 38th Annual Apex PeakFest (5/5), a time-honored arts and crafts festival in downtown Apex where more than 20,000 attendees gather for live music, kids&apos; entertainment, fair-themed food and more. 22. 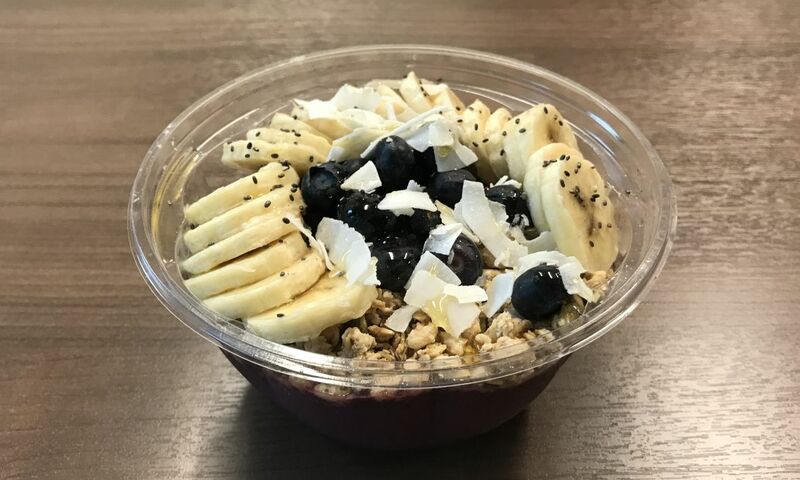 Dive in to any of these delicious—and healthy!—one-bowl meals (think poke, quinoa, açai and more), or go the opposite route and indulge with one of these 14 sweet or savory pies that locals love. 23. Help cheer on North Carolina Football Club as they kick off their first season as part of the men&apos;s professional United Soccer League (USL) at WakeMed Soccer Park in Cary. Aside from high-level soccer, you&apos;ll find free parking at the stadium, or on Saturdays you can hop on the Red and Blue Express—a free bus service from downtown Raleigh that provides a ride to the game, free beer, water and soda while on board and priority entrance into the game. 24. 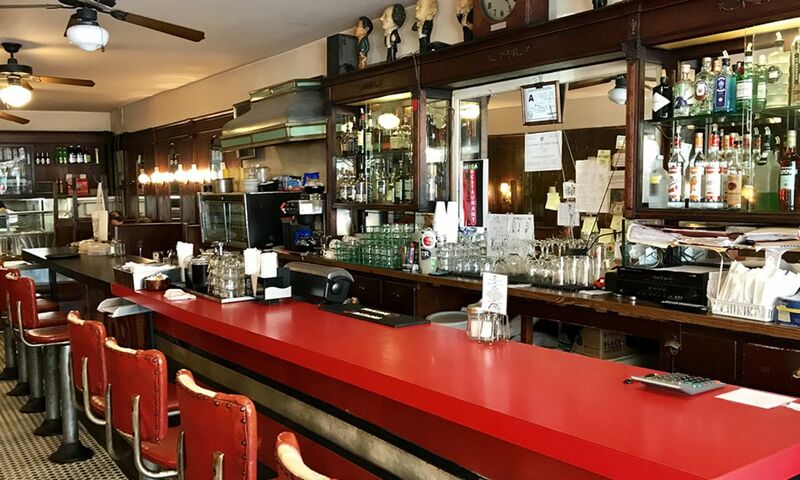 Score a table at Big Ed&apos;s City Market Restaurant—founded by legendary Southern restaurateur "Big Ed" Watkins—where farm-fresh country breakfast is served all-day long (and the complimentary biscuits are to die for!). 25. Take a trip to The Hideout, Lonerider Brewing Company&apos;s West Texas-themed brewery and taproom headed up by passionate mind Sumit Vohra (meet Sumit in the video below). Get your Raleigh Beer Trail Passport stamped, then make your way to other breweries to start earning your prizes (please drink responsibly and have a designated driver on hand). 26. 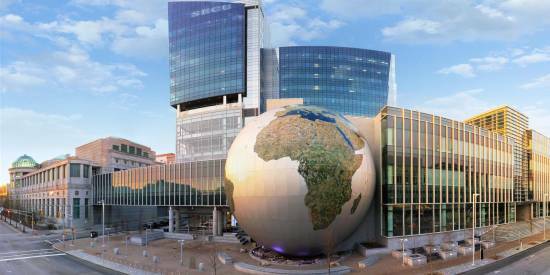 Head to the North Carolina Museum of Natural Sciences (recently announced as the most-visited attraction in the state for the fourth consecutive year!) to experience their newest featured exhibition, Mazes and Brain Games (through 9/3), a mind-boggling collection of adventures, 3-D puzzles and physical tests. 27. 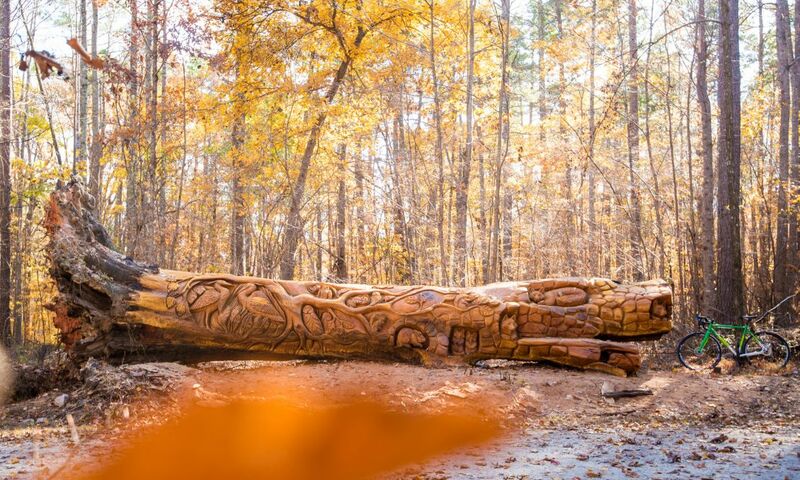 Find the brand-new, functional piece of art inside of William B. Umstead State Park. A fallen red oak tree—approximately 25 feet long and several feet high—has been transformed by chainsaw artists Jerry Redi and Randy Boni. The stunning piece, just completed in Nov. of 2017, is stopping park-goers in their tracks, pausing for photo opps and to appreciate the intricate found beautifully carved into the wood. Use our guide to plan out exactly how to find it among the park&apos;s 22 miles of hiking trails and 13 miles of multi-use trails! 28. 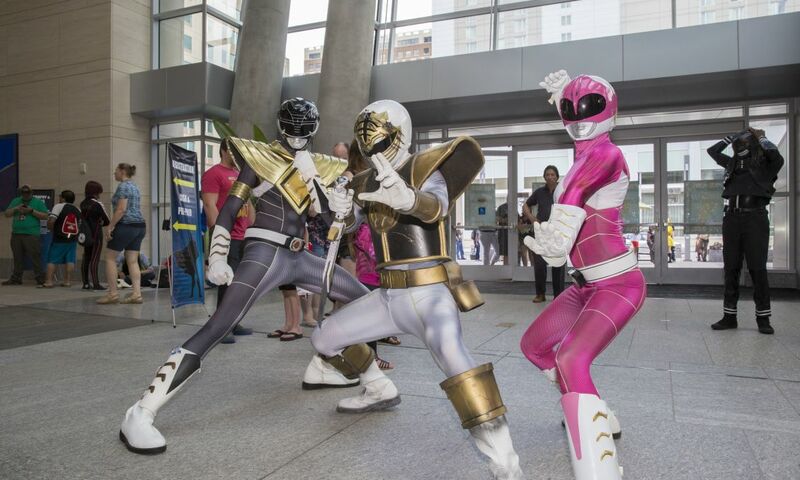 Get in on the action at Animazement (5/25-27), a three-day Japanese animation and culture celebration over Memorial Day weekend that draws 15,000 attendees to the Raleigh Convention Center. Seven Stellar Cons and Shows in Raleigh, N.C.
29. Pay a visit to Alamo Drafthouse Cinema, the beloved movie theater chain known for its passion towards film, food and beer, which has officially opened it&apos;s first N.C. location in Raleigh! The 11-screen complex, with theater capacity ranging from 49 to 109 seats, also features an Alamo first: the Video Vortex bar, an immersive video-themed bar where you can enjoy nearly 50 local beers on tap (or take them home in a 32-ounce can) plus dive into one of the largest rental collections of cinema in the country (75,000 classics, obscure releases, foreign films and more are on hand!). 30. 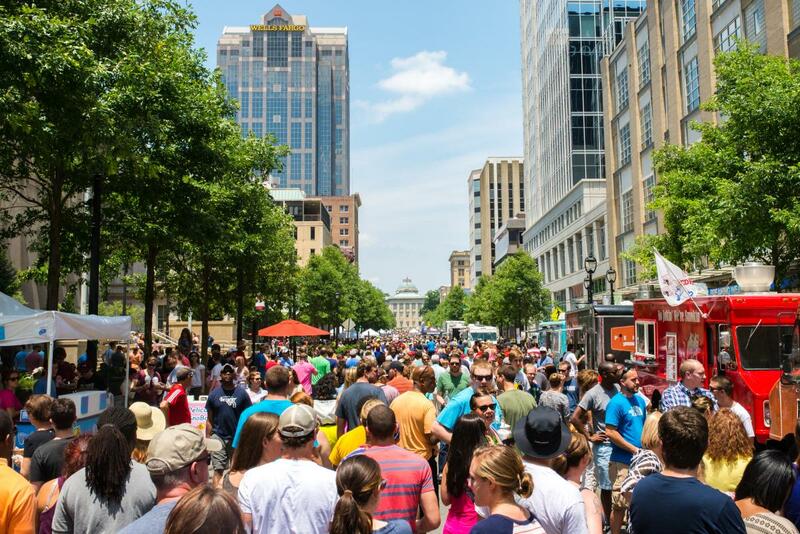 Giddy-up for another round of Downtown Raleigh Food Truck Rodeos (5/6 and 6/10)! 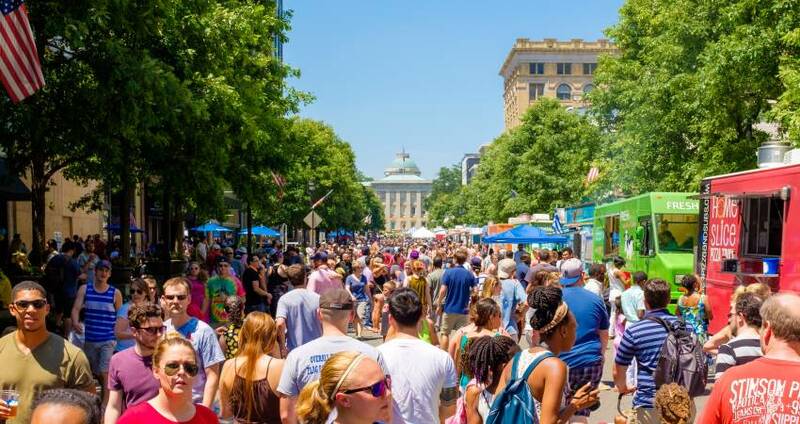 A half-mile of food trucks—lobster rolls, BBQ sandwiches, ice cream sundaes and way more—invade downtown Raleigh. Read our tips on what to know before you go!